Nominated for the Blue Metropolis/Conseil des arts de Montréal Literary Diversity Prize for a First Publication. 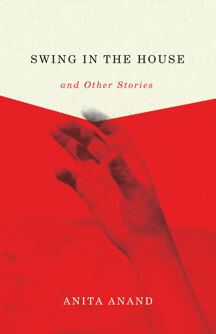 Swing in the House paints an utterly contemporary portrait of Canadian families in their most private moments. Anand pulls back the curtains to reveal the unspoken complexities within the modern home, from sibling rivalries to fracturing marriages, casual racism to damaged egos, hidden homosexuality to mental illness. Each of these stories offers a deftly-constructed morality play. In the novella-length title story, a young mother timidly explores the possibilities of an affair to alleviate the suffocation of a loveless marriage, to detrimental effect. In “Indelible Markers,” a girl vacationing in Greece learns that growing up with a schizophrenic father has affected her relationships with men. In “Something Steady,” a lonely, mentally challenged teen vents his anger on a co-worker’s boyfriend. Throughout, Anand’s incisive intelligence, sharp prose, and sly wit infuse dark undercurrents into these seventeen cautionary tales. “These stories are full of undercurrents that disturb the surface, and these disturbances, in their turn, dazzle as they reflect light.” - Elise Moser, author of Lily and Taylor and Because I Have Loved and Hidden It. 180 pp 8.5" x 5.5"